Welcome to the beginning of the Coyotes Lacrosse 2016 season! As many of your have heard, Jake Odden will be stepping down as President of Coyotes after five dedicated years. I am excited to be filling this role and look forward to working with our experienced coaches and parent volunteers. Many people have worked extremely hard behind the scenes to get this season started especially Jake Odden, Bill Wolfenden, and Dan Miller. Thank you for all your countless hours! We will be sending this newsletter weekly during the season to help communicate club wide news. For one week only, Coyotes gear will be available through our website. Please check out all the great swag! Congratulations to all our teams who kicked off their seasons these last weekends. The U13, U11 girls all started their season with a tournament on Treasure Island. While many of the boys teams had games this past weekend. Finally, thank you to all the parent volunteers who helped the games run smoothly on the sidelines. 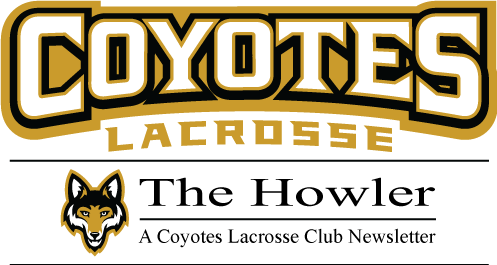 Coyotes Spirit Wear will be available on CoyotesLacrosse.org for one week only! Store closes Tonight! Get your Coyotes gear Now!